Greetings all...it's been a long time since I have updated you with a blog post! After a long absence, I think I'm ready to get back in the saddle, so to speak. I started a new full-time position in the middle of March and the adjustment in terms of my day-to-day life, not to mention energy levels, was more than I bargained for. The position required a steep learning curve and I came home each day exhausted and unable to think about being in the studio or doing more than a bare minimum to maintain my online life. Now, a couple months later, I believe I've gotten enough experience and gained enough confidence to be able to turn my attention back to the creative side of life. Any of the readers of this blog who have gone through such a life change can understand, I'm sure! So since I wrote last, spring finally came to South Dakota....though we had our doubts all the way through April. 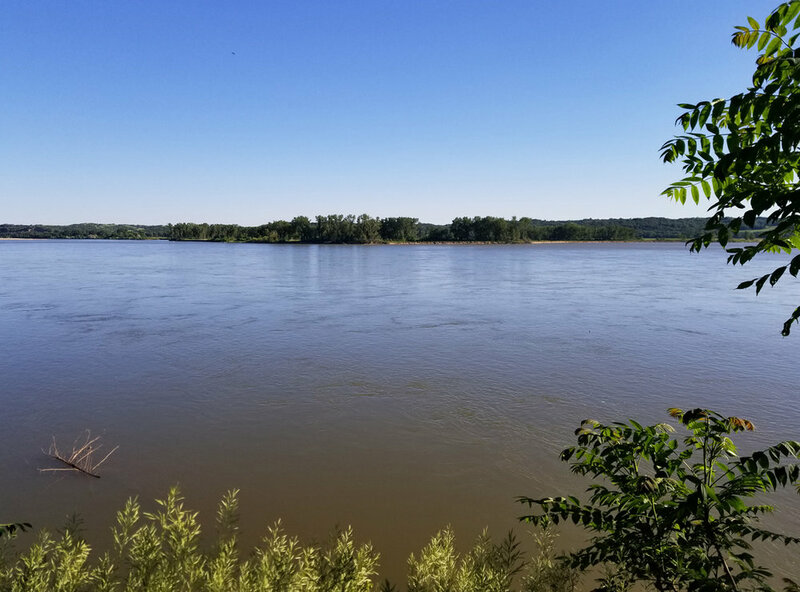 The Missouri River where we live is truly beautiful....quiet and peaceful! Days are getting longer and Johntimothy and I enjoy mornings with our tea on the front porch listening to the cacophony of bird song....and evenings in the back, either on the deck or at the fire pit, watching the river flow by. Since I've not really been in the studio, I'll take this opportunity to share a few shots of a recent trip. 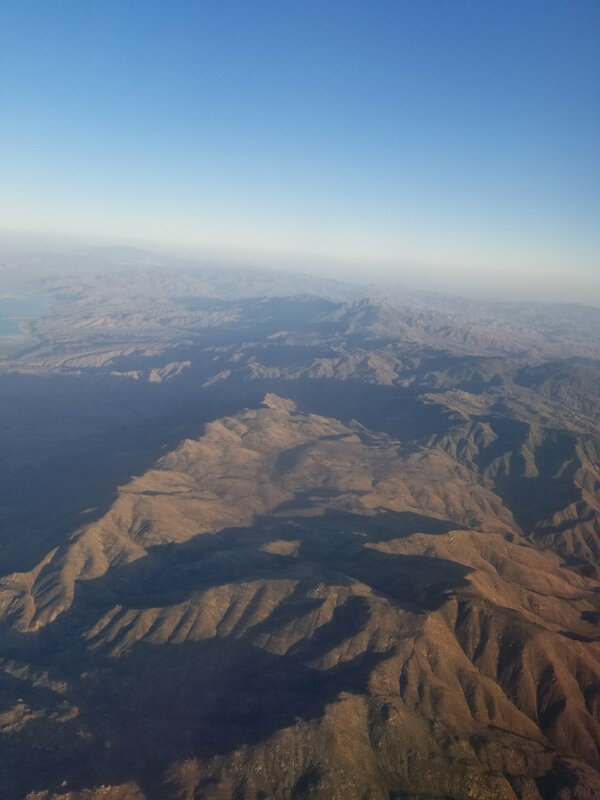 View of the mountains from the plane on our way to Seattle....via Phoenix! This trip out west was planned before I took the job, so I was able to take the time away and so glad to have spend a week with Johntimothy and some fun-loving family members at Lake Chelan, Washington. We were the guests of his cousin who booked a condo at a resort there, though none of us really knew anything about the area. We were delighted to find when we arrived that we were in the heart of a wine region, with more wineries in the area than we could possible visit in the week we were there....and not for lack of trying! Fabulous views, great food and wine and fine company....such a relaxing treat! The mountain air was fresh and the lake, though frigid cold, was the gorgeous blue green that tells you it was created from a glacier. Just stunning in all directions! At the tail end of the Chelan week, we had a day or so in Seattle, which is another place I dearly love (it was love at first sight on my initial visit nearly 20 years ago). Naturally, I insisted we all ride the ferry, so our last dinner together was at a fabulous restaurant on Bainbridge Island. On our last day, we got a final bonus along with the ferry ride....a spectacular view of Mt. Rainier that I'd never been able to see before. What a treat! We came home from that 10-day trip, exhausted but happy, as you do after experiencing so many wonders. And now, after another week at work, getting caught up there and at home, I think I can begin finding my way to studio. I hope to be back soon with some new work. But first, I'll be sharing some of Johntimothy's beautiful work....it's summer and with no classes to teach he can spend time in the studio (when he's not weeding, mowing, fixing the sprinkler system, etc.). I'm excited to share some of the prints and drawings he's been creating. Hope your spring has been filled with beauty and inspiration....see you soon!